Written by imperial command in the eighth century, The Kojiki: Records of Ancient Matters is Japan's classic of classics, the oldest connected literary work and the fundamental scripture of Shinto. A more factual history called the Nihongi or Nihon Shoki (Chronicles of Japan) was completed in A.D. 720, but The Kojiki remains the better known, perhaps because of its special concern with the legends of the gods, with the divine descent of the imperial family, and with native Shinto. Both works have immense value as records of the development of Japan into a unified state with a well-defined character. Indeed, even the mythological aspects were accepted as fact throughout most of subsequent Japanese history--until the defeat and disillusionment of the nation in 1945. This classic text is a key to the historical roots of the Japanese people--their early life and the development of their character and institutions--as well as a lively mixture of legend and history, genealogy, and poetry. It stands as one of the greatest monuments of Japanese literature because it preserves more faithfully than any other book the mythology, manners, language and traditions of Japan. It provides, furthermore, a vivid account of a nation in the making. The work opens "when chaos had begun to condense, but force and form were not yet manifest, and there was nought named, nought done ..." It recounts the mythological creation of Japan by the divine brother and sister Izanami and Izanagi; tales of the Sun Goddess and other deities; the divine origin of Jimmu the first emperor; and the histories of subsequent reigns. Epic material is complemented by a fresh bucolic vein expressed in songs and poetry. 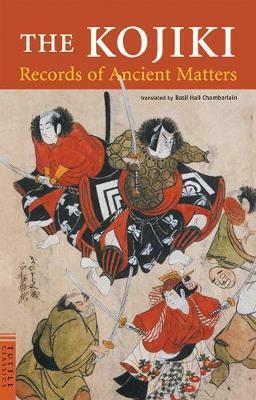 This famous translation by the British scholar Basil Hall Chamberlain is enhanced by notes on the text and an extensive introduction discussing early Japanese society, as well as The Kojiki and its background. Important for its wealth of information, The Kojiki is indispensable to anyone interested in things Japanese. Basil Hall Chamberlain (1850 - 1935), was one of the foremost Western translators. His translations include A Handbook of Colloquial Japanese (1888) and Things Japanese (1890).